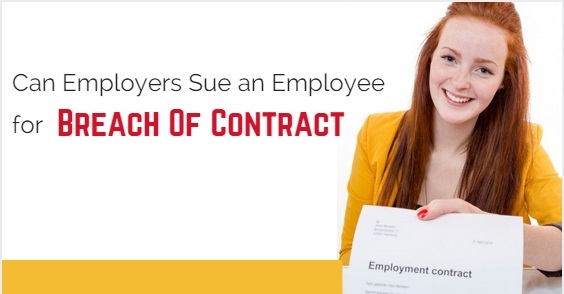 Can Employers Sue an Employee for Breach of Contract? One of the most stable things about a job is its contract. Breach of Employment Contract is usually maintained by every company to safeguard the rights of the employers as well as the employees equally. It also helps in understanding the working procedures of the company by the employees who have been hired. The employers, as well as employees, are equally responsible for maintaining the ethics and rules of the contracts and not breach its guidelines. The contract in any job has to be signed and sealed before beginning the job as soon as a person is hired. The guidelines of the contract include everything, from the time period of work of a person, is expected to complete at the firm along with the other formalities like rules, regulations, ethics and principles that need to be followed at the workplace. The framework of a contract is structured by legal authorities by keeping in mind the well-being of both the parties. The contract has a lot of legal importance and it can be used both by the employer as well as employee if the former fails to abide by it or ends up breaking the rules prescribed in it. Since the contract is signed by both the employer as well as the employee as soon as the employee is hired by the firm; it leaves no cause of breach as the employee is considered to accept everything that is mentioned in the contract as it is sealed by his signature. The breach of contract can have a variety of punishments and pitfalls which are already mentioned in the contract itself. The severity of breaking a contract depends upon the severity of the action taken against the firm by the employee or vice versa. Legal action or a penalty is required on account of the breach of contract as the breach may prove to be a hindrance to the company’s or individual’s growth. Mentioned below are the types of breach of contract which can lead to a penalty of legal punishments. Damage to the property owned by the company or the firm is one of the breaches of contract taken seriously by the employers. The property of the company is expected to be used in a civilised manner and not misused in any way. If an employee is found to have damaged the property either knowingly or unknowingly shall be dealt with either a legal notice or penalty. All the employees are expected to, at all times use the property with care and not use it for wrongful purposes. If an employee is allowed to use a car of the company for company related expeditions and he drives rashly or causes any form of damage to the car, he is responsible for the damage and has to either pay for the damages or get the company another car depending on the damage done. If an employee gives away confidential information or any other information to another company or firm who is either on par with the former company or wants to get in the position, then the employee can get a legal notice for breach of confidentiality agreement. Every contract formed by the company for its employees have a confidentiality agreement in itself. Maintaining confidential information is the most important job of the employees and everyone who is hired is expected to be loyal to the company by keeping the information confidential. Usually, employees who give away confidential information do it with the intention of acquiring higher positions in the firm to which they have helped along with other financial and economic bonuses. Sometimes, controversial information about the firm may also be given to the media to be splashed across which may cause instability in the company as well as disintegrate its public image. Employees who fail to provide a notice of a couple of weeks before resigning are likely to be sued by the company. It is necessary for an employee to give a notice to the company as it gives the company enough time to fill in his appointed place with someone capable enough to run it smoothly. If an employee fails to do so, the regularities of the company may suffer as there would be no one to take the place of the resigned. Employers make it very clear in their contracts that the employee has to give a prior notice to the firm before resignation as it is important for the employee to make sure the firm runs smoothly and his job is done before leaving it. Suing an employee for such actions may lead to legal action if the position of the employee is high or he may be entitled to pay an amount prescribed by the lawyers or the firm. Usually, the firm avoids the legal interactions as it may lead to exposure by the media which might, in turn, cause bad publicity for the firm and damage its reputation. After an employee has left the firm and he is found to be working with a competitor of the firm where he was previously employed, chances are that he may give away information which is confidential to the firm which might hinder the growth or development of the firm. A person who indulges in such form of activity may be sued severely by the firm and shall face various legal notices for the breach of contact. People who are hired for important positions in the firm have the agreement of not working with the competitor of divulging the strategies or the confidential information about the firm after their resignation. All the details about the agreements are clearly stated in the contract which a person signs his approval of at the beginning of his job in the firm. Breach of contract can cause heavy damages to the employers as well as the employee as it may lead to a downfall of the firm in which the employee worked as well as the firm in which he is currently working. An employer can sue an employee if he fails to perform his duty or obligations that he has been entitled or expected to by the firm or the company. With a job come various obligations. An employee is paid by the employers as he manages to perform his tasks to the best of his ability and gives what is expected of him to the firm. However, if a person who is being paid for his obligations and fails to fulfil them can be sued for misguiding the employers into believing him that he could be relied upon. In the world where time is considered to be money and time wasted by an employee who fails at performing his task can be sued by the firm or asked to pay compensation for the task that hasn’t been completed. The failure to perform one’s obligation is considered as a fundamental breach and legal action is possibly taken against it. Honesty is the important quality expected in the firm by their employees. A person who is dishonest about his achievements and his education, there are chances that the firm might sue him or the employee may have to pay the price for misgivings. Since in every firm, the work is given as per the achievements and qualifications of the candidate the breach of honesty can lay heavily on the reputation of the firm. A person who is dishonest about himself not only puts his reputation in jeopardy but also of the firm in which he has been working in as his act indirectly makes the market question the honesty of the firm. Hence, an employer can sue the employee for the breach of honesty or wrongdoing. When an employer sues an employee, his own reputation is also at the risk of getting straddled in the market, as when an employee is hired he becomes a part of the company. His name is associated with the firm no matter how insignificant his job profile is. Hence, the employers at the firm always tries to deal with matters within the walls of the company and deal with the employee who has breached the contract personally to avoid any form of bad publicity. For any firm, their reputation is their biggest asset and to protect its asset is the most important obligation faced by the employers. However, if an employee is charged with breaching a contract, his entire career may fall in jeopardy and lead to innumerable problems faced by the legal authorities.